Like many (most?) 21st-century North Americans, I hate to be told I’ve done something ableist (or racist, or sexist). Why does it sting so much, and how should I think about such a charge, when it is leveled against me? Short answer: It stings so much because it’s usually partly, if only partly, true—and partly true criticisms are the ones that sting worst. And the best reaction to the charge is, usually, to recognize its partial, if only partial, truth. How fortunate I am! If I happen to make a mistake, others are sure to inform me. This is difficult advice to heed. Note, though: If I make a mistake. He (she, they) who rightly criticizes me. Someone who criticizes me wrongly is no teacher, only an annoying pest! And if you’re anything like me, then your gut reaction to charges of ableism will usually be to want to swat back at the pest, to assume, defensively, that the criticism must be off-target, because of course you’re a good egalitarian, committed to fighting unjustified prejudice! No. Here’s the thing. We all have ableist reactions and engage in ableist practices sometimes, to some degree. Disability is so various, and the ableist structures of our culture so deep and pervasive, that it would be superhuman to be immune. Maybe you are immune to ableism toward people who use wheelchairs. Maybe your partner of many years uses a wheelchair and you see wheelchair-use as just one of the many diverse human ways of comporting oneself, with its challenges and (sometimes) benefits, just like every other way of getting around. But how do you react to someone who stutters? How do you react to someone who is hard of hearing? How do you react to someone with depression or PTSD? Someone with facial burns or another skin condition you find unappealing? Or a very short man? What sorts of social structures do you manifest and reinforce in your behavior? In your choice of words? In your implicit assumptions? In what you expect (and don’t expect) people to be able to do? Here’s my guess: You don’t always act in ways that are free of unjustified prejudice. If someone calls you out on ableism, they might well be right. You might sincerely and passionately affirm that "all people are equal"—whatever that amounts to, which is really hard to figure out!—and you might even pay some substantial personal costs for the sake of a more just and equal society. In this respect, you are not ableist. You are even anti-ableist. But you are not a unified thing. Unless you are an angel walking upon the Earth, our society’s ableism acts through you. An absurd charge does not sting. If someone tells me I spend too much time watching soccer, the charge is merely ridiculous. I don’t watch soccer. But if someone charges me with ableism, the partial truth of it does sting, or at least the plausibility of it stings. Maybe I shouldn’t have used the particular word that I used. Maybe I shouldn’t have made that particular assumption or dismissed that particular person. Maybe, deep down, I’m not the egalitarian I thought I was. Ouch. Your ableist actions and reactions can be hard to recognize and admit if you implicitly assume that people have unified attitudes. If people have unified attitudes, they are either prejudiced against disabled people or they are not. If people have unified attitudes, then evidence of ableist behavior is evidence that you are one of the prejudiced, one of the bad guys. No one wants to think that about themselves. If people have unified attitudes, then it’s easy to assume that because you explicitly reject ableism you cannot be simultaneously enacting the very ableism that you are fighting against. The best empirical evidence suggests that people are highly disunified—inconstant across situations, capable of both great sacrifice and appalling misbehavior, variable in word and deed, spontaneously enacting our cultural practices for both good and bad. If this is true, then you ought to expect that charges of ableism against you will sometimes stick. You should be unsurprised if they do. But you should also celebrate that these charges are only very partial: The whole you is not like that! The whole you is a tangled chaos with many beautiful, admirable parts! If you accept your disunity, you ought also to be forgiving. You ought to be forgiving especially if you cast your eye more broadly to the many forms of prejudice and injustice in which we participate. Suppose, impossibly, that you were utterly free of any ableist tendencies, practices, or background assumptions. It would be a huge life project to achieve that. Are you equally free of racism, classism, sexism, ageism, bias against those who are not conventionally beautiful? Are you saving the environment, fighting international poverty, phoning your senators about prisons and wage justice, volunteering in your community? We must pick our projects. A more vivid appreciation of our own disunity, flaws, and abandoned good intentions ought to make us both more ready to see the truth in charges of prejudice against us and also more forgiving of the disunity, flaws, and abandoned good intentions in others. University administrators sometimes think it's a good idea to eliminate their philosophy departments. Some of these efforts have been stopped, others not. This has led me to wonder how prevalent philosophy departments are in U.S. colleges and universities, and how their presence or absence relates to institution type. 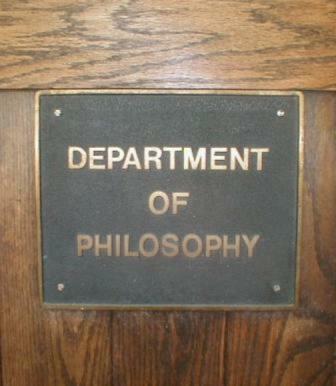 Since some schools combine philosophy with another department (e.g. 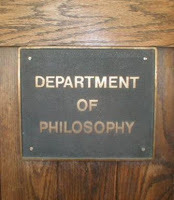 "Philosophy and Religion") I distinguished standalone philosophy departments from combined departments that explicitly mention "philosophy" in the department name along with something else. I welcome corrections! The websites are sometimes a little confusing, so it's likely that I've made an error or two. Eighteen of the twenty sampled "national universities" have standalone philosophy departments (or equivalent: note 1) and majors. The only two that do not are institutes of technology: Georgia Tech (ranked #34) and Florida Tech (#171). Virginia Tech (#74), however, does have a Department of Philosophy and a philosophy major -- as do Stanford, Duke, Rice, Rochester, Penn State, UT Austin, Rutgers-New Brunswick, Baylor, U Mass Amherst, Florida State, Auburn, Kansas, Biola, Wyoming (for now), North Carolina-Charlotte, Missouri-St Louis, and U Mass Boston. Similarly, seventeen of the twenty sampled "national liberal arts colleges" have standalone philosophy departments, and eighteen offer the philosophy major. Offering neither department nor major are Virginia Military Institute (#72) and the very small science/engineering college Harvey Mudd (#21) (circa 735 students, part of the Claremont consortium). Beloit College (#62, circa 1358 students) offers the philosophy major within a "Department of Philosophy and Religious Studies". Seven of the twenty sampled regional colleges have a standalone philosophy department, and another four have a combined department with philosophy in its name. Seven offer a philosophy major, and one (Brevard) has a "Philosophy and Religion" major. Offering neither major nor department: California Maritime Academy, Marymount California U (not to be confused with Loyola Marymount), Paul Smith's College (not to be confused with Smith College), Alderson Broaddus, Dickinson State, North Carolina Wesleyan, Crown College, and Iowa Wesleyan. Four of these are specialty schools: California Maritime Academy and Marymount California each offer only six majors total, Paul Smith's focuses on tourism and service industries, and Iowa Wesleyan offers only three Humanities majors: Christian Studies, Digital Media Design, and Music. Offering major and/or standalone or combined department: Carroll, Mount Union, Belmont Abbey, La Roche, St Joseph's, Blackburn, Messiah, Tabor, Ottawa University (not to be confused with University of Ottawa), Northwestern College (not to be confused with Northwestern University), and Cazenovia College. In my sample of forty nationally ranked universities and liberal arts colleges, each one has a standalone philosophy department and offers a philosophy major, with the following exceptions: three science/engineering specialty schools, one military institute, and one school offering a philosophy major within a department of "Philosophy and Religious Studies". The schools that US News describes as "regional" are mixed. In this sample of forty, about half offer philosophy majors and about half have standalone philosophy departments. Among the fifteen with neither department nor major in philosophy, six are specialty schools. I'll refrain from drawing causal or normative conclusions here. I'm tempted to conclude that, with the exception of specialty schools, almost every nationally ranked university and liberal arts college, no matter how small, has a philosophy major and a large majority have a standalone philosophy department. But maybe that's too strong a claim to draw from a sample of forty? So I've doubled the sample. Note 1: Some schools don't appear to have "departments" or have very broad "departments" that encompass many majors. If a school had fewer than fifteen "departments" I attempted to assess whether it had a department-like administrative unit for philosophy, or if that assessment wasn't possible, whether it hosted a philosophy major apparently on administrative par with popular majors like psychology and biology. Last week I posted a defense of anger and empathy against recent critiques by Owen Flanagan and Paul Bloom. The post drew a range of lively responses in social media, including from Flanagan and Bloom themselves. My main thought was just this: Empathy and anger are part of the rich complexity of our emotional lives, intrinsically valuable insofar as having rich emotional lives is intrinsically valuable. 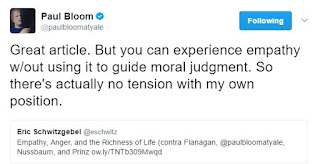 We can, of course, also debate the consequences of empathy and anger, as Flanagan and Bloom do -- and if the consequences of one or the other are bad enough we might be better off in sum without them. But we shouldn't look only at consequences. There is also an intrinsic value in having a rich emotional life, including anger and empathy. I have presented Flanagan's and Bloom's views simply: Flanagan and Bloom argue against anger and empathy, respectively. Their detailed views are more nuanced, as one might expect. One interpretive question is whether it is fair to set aside this nuance in critiquing their views. Well, how do they themselves summarize their views? Flanagan argues in defense of the Stoic and Buddhist program of entirely "eliminating" or "extirpating" anger, against mainstream "containment" views which hold that anger is a virtue when it is moderate, appropriate to the situation, and properly contained (p. 160). Although this is where he puts his focus and energy, he adds a few qualifications like this: "I do not have a firm position [about the desirability of entirely extirpating anger]. I am trying to explore varieties of moral possibility that we rarely entertain, but which might be genuine possibilities for us" (p. 215). Bloom titles his book Against Empathy. He says that "if we want to make the world a better place, then we are better off without empathy" (p. 3) and "On balance, empathy is a negative in human affairs" (p. 13). However, Bloom also allows that he wouldn't want to live in a world without empathy, anger, shame, or hate (p. 9). At several points, he accepts that empathy can be pleasurable and play a role in intimate relationships. It's helpful to distinguish between the headline view and the nuanced view. Here's what I think the typical reader -- including the typical academic reader -- recalls from their reading, two weeks later: one sentence. Maybe "Bloom is against empathy because it's so biased and short-sighted". Maybe "Flanagan thinks we should try to eliminate anger, like a Buddhist or Stoic sage". These are simplifications, but they come close enough to how Bloom and Flanagan summarize and introduce their positions that it's understandable if that's how readers remember their views. In writing academic work, especially academic work for a broad audience, it's crucial to keep our eye on the headline view -- the practical, memorable takeaway that is likely to be the main influence on readers' thoughts down the road. As an author, you are responsible for both the headline view and the nuanced view. Likewise, as a critic, I believe it's fair to target the headline view as long as one also acknowledges the nuance beneath. In their friendly replies on social media, both Bloom and Flanagan seemed to acknowledge the value of engaging first at the headline level; but they both also pushed me on the nuance. Hey, before I go farther, let me not forget to be friendly too! I loved both these books. Of course I did. Otherwise, I wouldn't have spent my time reading them cover-to-cover and critiquing them. Bloom and Flanagan challenge my presuppositions in helpful ways, and my thinking has advanced in reacting to them. For more on the downsides of nuance, see Kieran Healy. In this tweet, Bloom appears to be suggesting that empathy is fine as long as you don't use it to guide moral judgment. (He makes a similar claim in a couple of Facebook comments on my post.) Similarly, at the end of his book, he says he worries "that I have given the impression that I am against empathy" (p. 240). An understandable worry, given the title of his book! (I am sure he is aware of this and speaking partly tongue in cheek.) He clarifies that he is against empathy "only in the moral domain... but there is more to life than morality" (p. 240-241). Empathy, he says, can be an immense source of pleasure. The picture seems to be that the world would be morally better without empathy, but that there can be excellent selfish reasons to want to experience empathy nonetheless. If the picture here is that there are some decisions to which morality is irrelevant and that it's fine to be guided by empathy in those decisions, I would object as follows. Every decision is a moral decision. Every dollar you spend on yourself is a dollar that could instead be donated to a good cause. Every minute you spend is a minute you could have done something more kind or helpful than what you actually did. Every person you see, you could greet warmly or grumpily, give them a kind word or not bother. Of course, it's exhausting to think this way! But still, there is I believe no such thing as a morally innocent choice. If you purge empathy from moral decision-making you purge it from decision-making. Here's what seems closer to right, to me -- and what I think is one of the great lessons of Bloom's book. Public policy decisions and private acts directed toward distant strangers (e.g., what charities to support) are perhaps, on average, better made in a mood of cool rationality, to the extent that is possible. But it's different for personal relationships. Bloom argues that empathy might make us "too-permissive parents and too-clingy friends" (p. 163). This is a possible risk, sure. Sometimes empathic feelings should be set aside or even suppressed. Of course, there are risks to attempting to set aside empathy in favor of cool rationality as well (see, e.g., Lifton on Nazi doctors). Let's not over-idealize either process! In some cases, it might be morally best to experience empathy and to be able to act otherwise if necessary, rather than not to feel empathy. Furthermore, it might be partly constitutive of the syndrome of full-bodied friendship and loving-parenthood that one is prone to empathy. I am Aristotelian or Confucian enough to see the flourishing of such relationships as central to morality. This is helpful -- and also not entirely Buddhist or Stoic (which of course is fine, especially since Flanagan presented his earlier arguments against anger as only something worth exploring rather than his final view). In his thinking on this, Flanagan has partly been influenced by Myisha Cherry's and others' work on anger as a force for social change. I appreciate the defense of anger as a path toward social justice. But I also want to defend anger's intrinsic value, not just its instrumental value; and specifically I want to defend the intrinsic value of payback anger. The angry jerk is an ugly thing. Grumping around, feeling his time is being wasted by the incompetent fools around him, feeling he hasn't been properly respected, enraged when others' ends conflict with his own. He should settle down, maybe try some empathy! But consider, instead, the angry sweetheart. I see the "sweetheart" as the opposite of the jerk -- someone who is spontaneously and deeply attuned to the interests, values, and attitudes of other people, full of appreciation, happy to help, quick to believe that he rather than the other might be in the wrong, quick to apologize and in extreme cases sometimes being so attuned to others' perspectives that he risks losing track of his own interests, values, and attitudes. Spongebob Squarepants, Forrest Gump, sweet subordinate sitcom mothers from the 1950s and 1960s. These people don't feel enough anger. We should, I think, cheer their anger when it finally rises. We should let them relish their anger, the sense that they have been harmed and that the wrongdoer should pay them back. I don't want sweethearts always to be bodhisattvas toward those who wrong them. 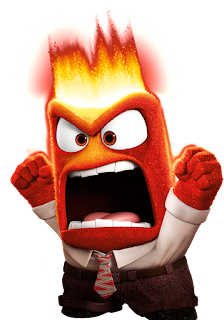 Anger manifests the self-respect that they should claim, and it's part of the emotional range of experience that they might have too little of. Some people suggested that eliminating anger might result in opening up other different ranges of emotions, in the right kind of sage. Interesting thought! I'd also add that there's a kind of between-person richness that I'd celebrate. If sages can eliminate anger as a great personal and moral accomplishment, I think that's wonderful. My concern is more with the ideal of a blanket extirpation as general advice. Some people pointed out that the anger of the oppressed is particularly worth cultivating -- and that there may even be whole communities of oppressed people who feel too little anger. Yes! Others wondered about whether I would favor adding brand-new unheard-of negative emotions just to improve our emotional range. This would make a fascinating speculative fiction thought experiment. More later, I hope. In addition to the comments section at The Splintered Mind, the public Facebook conversation was lively and fun. "Reflective equilibrium" is sometimes treated as the method of ethics (Rawls 1971 is the classic source). In reflective equilibrium, one considers one's judgments, beliefs, or intuitions about particular individual cases (e.g., in such-and-such an emergency would it be bad to push someone in front of an oncoming trolley?). One then compares these judgments about cases with one's judgments about general principles (e.g., act to maximize total human happiness) and one's judgments about other related cases (e.g., in such-and-such a slightly different emergency, should one push the person?). Balance them all together, revising the general principles when that seems best in light of what you regard as secure judgments about the cases, and revising one's judgments about specific cases when that seems best in light of one's judgments about general principles and related cases. Repeat the process, tweaking your judgments about cases and principles until you reach an "equilibrium" in which your judgments about principles and a broad range of cases all fit together neatly. In "wide" equilibrium, you get to toss all other sources of knowledge into the process too -- scientific knowledge, reports of other people's judgments, knowledge about history, etc. How could anything be more sensible than that? I am inclined to agree that no approach is more sensible. It's the best way to do ethics. But, still, our best way of doing ethics might be irredeemably flawed. The crucial problem is this: The process won't bust you out of a bad enough starting point if you're deeply enough committed to that starting point. And we might have bad starting points to which we are deeply committed. Consider the Knobheads. This is a species of linguistic, rational, intelligent beings much like us, who live on a planet around a distant star. Babies are born without knobs on their foreheads, but knobs slowly grow starting at age five, and adults are very proud of their knobs. The knobs are simply bony structures, with no function other than what the Knobheads give them in virtue of their prizing of them. Sadly, 5% of children fail to start growing the knobs on their foreheads, despite being otherwise normal. Knobheads are so committed to the importance of the knobs, and the knobs are so central to their social structures, that they euthanize those children. Some Knobhead philosophers ask: Is it right to kill these knobless five-year-olds? They are aware of various ethical principles that suggest that they should not kill those children. And let's suppose that those ethical principles are in fact correct. The Knobheads should, really, ethically, let the knobless children live. But Knobheads are deeply enough committed to the judgment that killing those children is morally required that they are willing to tweak their judgments about general principles and other related cases. "It's just the essence of life as a Knobhead that one has a knob," some say. "It's too disruptive of our social practices to let them live. And if they live, they will consume resources and parental energy that could instead be given to proper Knobhead children." Etc. It seems possible that wide reflective equilibrium, even ideally practiced, could fail the Knobheads and Hedons. All that needs to be the case is that they are too implacably committed to some judgments that really ought to change (the Knobheads) or that they are insufficiently committed to judgments that ought not to change (the Hedons). To succeed as a method, reflective equilibrium requires that our reflective starting points be approximately well-ordered in the sense that our stronger commitments are normally our better commitments. Otherwise, reflective tweaking might tend to move practitioners away fromrather than toward the moral truth. Biological and cultural evolution, it seems, could easily give rise to groups of intelligent beings whose starting points are not well-ordered in that way and for whom, therefore, reflective equilibrium fails. Of course, the crucial question is whether we are such beings. I worry that we might be.